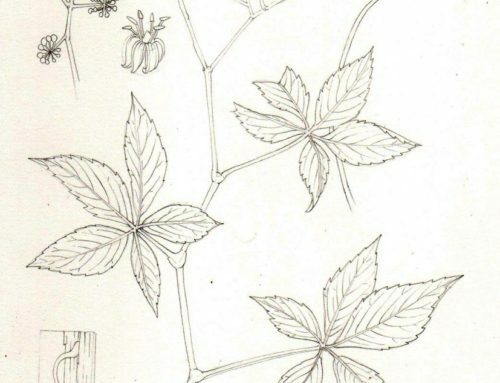 Located in the beautiful Virginia countryside, in the historic town of Middleburg, is a remarkable museum and library dedicated to the art, literature and culture of horse and field sports, it is called the National Sporting Library and Museum. National Sporting Library and Museum in Middleburg, Virginia. 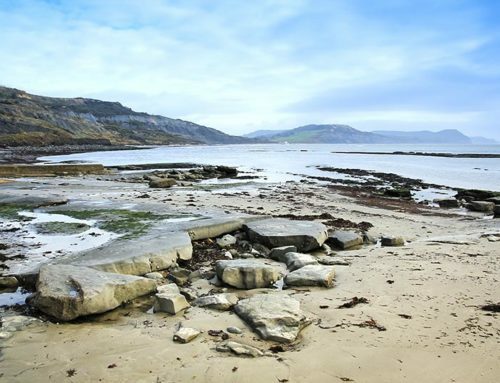 I recently had the opportunity to visit this museum and view an outstanding exhibition called “Out in the Open”, featuring approximately 70 paintings by British artist Sir Alfred James Munnings (1878-1959). Munnings is best known for his paintings of horses and race scenes. 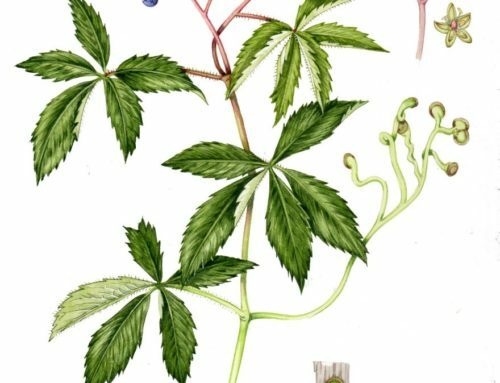 I was familiar with some of his work, but this comprehensive exhibition made me appreciate the brilliance of this artist. 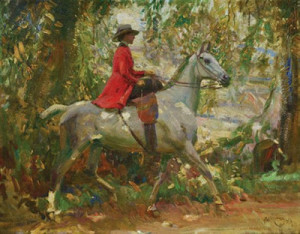 The Morning Ride, Florence Munnings on Horseback, Sir Alfred Munnings, 1913, oil on canvas. 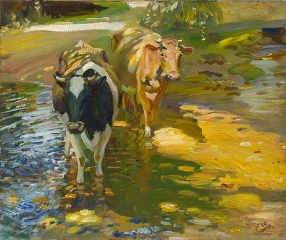 Impressions of Cows in a Stream, Sir Alfred Munnings, 1912, oil on canvas. The son of a miller, Munnings was born in 1878 in Mendham, Great Britain. In 19thcentury England horses were part of every life, but it was the gift of a toy horse that got Munnings interested in this magnificent animal and its portrayal. 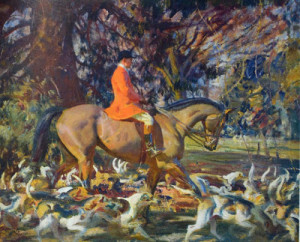 Study of a Clipped Bay Hunter “Bitter Sweet”, Sir Alfred Munnings, 1923, oil on panel. 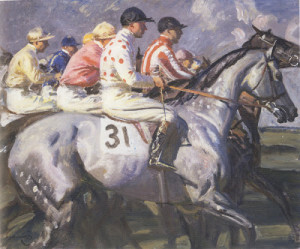 Among the various themes painted by Munnings was his depiction of horse races. One in particular reminded me of Edgar Degas and his race scenes. “Almost Away” is a tightly composed painting featuring a contrasting riot of jockey silk colors. 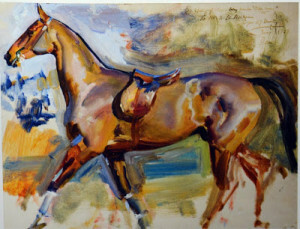 This painting, the color and expression of the horses evokes the raw energy of the race. Almost Away, Sir Alfred Munnings, 1945, oil on canvas. In many of the paintings Munnings juxtaposes highly polished passages with abstract ones. In the piece “In the Covert” he paints the horse and rider in a refined manner and surrounds them with a futurist like depiction of the hounds and landscape. In the Covert, Sir Alfred Munnings, 1920, oil on canvas. 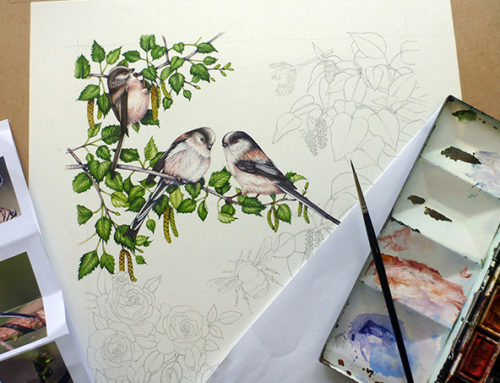 Castle Hill in Essex, Munnings’ elegant home for forty years, is a museum dedicated to his work. It houses a collection of over 600 works by Munnings including numerous landscapes and cloud studies of the surrounding countryside. 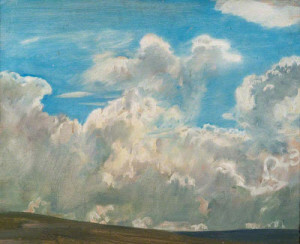 Cloud Study by Sir Alfred Munnings, oil on canvas. This extraordinary exhibition closed on September 15, 2013. The National Sporting Library and Museum was its only venue. I was very fortunate to see this exhibition before it closed. I would recommend that if you are interested in learning more about this fascinating artist you read the exhibition catalog “Munnings, Out in the Open”’ published by the National Sporting Museum and Library. There is a movie called “Summer in February”, based on the 1996 book by Jonathan Smith of the same title, about Munnings that is soon to be released.